Warp Records have a special place in my life. When I was getting into dance music, they released a bunch of LP’s under the banner “Artificial Intelligence”. Featuring the likes of Black Dog Productions, Autechre, Aphex Twin (as Polygon Window), B12 and others, they made odd electronic tunes with little or no relevance to any dancefloor you might wander onto. Ranging from strange clanky noise (Mr Twin), melodic tunefulness (B12), ominous rumblings (Autechre), to frankly deranged alien-jazz glitchiness (Black Dog)1, it was an explosion of invention when most people were panting over the dreadful retro-ness of Stone Roses and bloody Primal Scream. So, taking their oddness fully to my heart, I listened to those albums again and again and again. Great driving music (I used to regularly drive 300 miles in a Morris Minor so you need something to distract you from the fact that the wheels are going to come off if you go above 90), great comedown music, and quite good fun to scare friends, family and neighbours with. After the label’s electronic start, they diversified into everything from Grizzly Bear to Jamie Liddell. As important a label to music as Rough Trade, or 4AD, or Factory, or SST, they are the work of pure genius. Amazingly, it’s their 20th anniversary this year, and they’ve done gone and set up a little vote for us to go and choose our favourite tracks. The top 20 will be released on a compilation later this year. So go on, register, and vote. I’m loftandlost by the way. 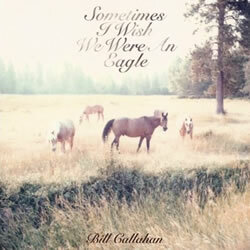 Rather different to Intelligent Techno is the work of Bill Callahan (Smog). A longtime favourite of mine, he’s made some truly jaw-dropping music over the last fifteen years or so. Listening to “Teenage Spaceship” whilst driving through the Taunus mountains near Frankfurt one summers evening as dusk drew in, is one of my happiest moments on this sweet earth. Strange what makes some people happy, isn’t it? Ol’ Bill has moved to Austin, Texas (lovely place) and has recorded a new album which is out on April 14th. “Sometimes I Wish We Were An Eagle” is his thirteenth album, and he’s brought back the horns and violins for this one. Whilst not quite as unexpected as on “Red Apple Falls”, they add some welcome colour to the songs. Of which I have one here, the oddly titled “Eid Ma Clack Shaw”. In it, he tells a tale of dreaming the “perfect song”, only when he wakes, and scribbles down the words, they read “Eid Ma Clack Shaw”. All the keystone Callahan-isms are there, from his sardonic baritone, to the dry, black humour in his lyrics. Bodes well for the album. Let’s hope it’s better than M Ward’s or Bonnie “Prince” Billy’s latest, eh? 1 I’ve said it before and I’ll say it again. Timbaland totally nicked Black Dog’s ideas, toned them down a bit, then chucked some rappers over the top. Not to belittle him one bit – he’s fantastic – but it would be great for the originators of that clicky, glitchy sound to get some recognition.